You must pass 4 CPA Exam sections to earn the CPA certification. And, one of them will be Financial Accounting and Reporting (FAR). In order to pass the CPA FAR exam, you’ll need to know all the details about the content, pass rates, questions, format, difficulty, structure, timing, and more. Therefore, you can get all that information here so the FAR CPA Exam section isn’t a problem for you. According to the FAR CPA Exam Blueprints, the CPA FAR exam section focuses on knowledge of generally accepted accounting principles for business enterprises, not-for-profit organizations, and governmental entities as well as the skills related to that knowledge. Fulfilling the Certified Public Accountant position involves having comprehensive and current financial accounting and reporting knowledge and skills. Therefore, the CPA Exam tests CPA candidates for such knowledge and skills in the FAR section. So, whether or not you love financial reporting, financial statements, and transactions, you must know all about these components of accounting in order to pass the FAR CPA Exam section. Basically, FAR is the section of the CPA Exam that makes you do the most accounting. For this reason, FAR has a reputation for being a bit of a beast. However, if you love accounting plain and simple, FAR probably won’t be so bad for you. If you struggle with these topics, then your best plan of attack is to do everything you can to pass the first time. But either way, you’ll need all of this essential CPA FAR exam information to start the process of passing. As I mentioned, FAR deals with financial accounting. In 4 content areas, FAR mainly addresses financial reporting, financial statement accounts, transactions, and state and local governments. This table breaks down the CPA FAR exam content for you. The most recent FAR pass rates have been fairly standard. For example, the Q2 2018 pass rate was higher than the Q2 2017 pass rate, which is normal. And, the Q3 pass rate was also higher in 2018 than in 2017. However, the Q3 2018 pass rate was lower than the Q2 2018 pass rate, which bucks the pass rate trends a bit. Like I said, FAR’s known as a very challenging CPA Exam section. In fact, according to the pass rates, it’s the hardest CPA Exam section. Only twice in the past 12 years has FAR had the highest pass rates among the CPA Exam sections. And in the last 5 years, FAR’s pass rates have been the lowest. For example, the FAR pass rates always go down very far when the exam changes (which happened in 2017 and 2018). And even when the latest exam version favors the candidate, FAR has been unable to put up pass rates higher than 50%. FAR is such a tough CPA Exam section not because its questions are the most difficult, but because its scope is the broadest. Essentially, FAR covers a vast amount of content, and consequently requires more study time than the other exam sections. Therefore, candidates who don’t take FAR first but instead try to fit all of the necessary studying into the 18-month window can run out of time and contribute to FAR’s humble pass rates. Additionally, the FAR CPA Exam section takes on some tricky concepts, like bonds, pensions, and stockholder equity or governmental accounting. So, if you don’t dedicate yourself to mastering your weak areas but simply cross your fingers and hope to avoid any questions about such topics on exam day, you’re very likely to be disappointed. And with FAR pass rates what they are, you’re almost as likely to fail. FAR uses 2 different types of questions to test your knowledge of all its content: multiple-choice and task-based simulations. Both types of questions contribute 50% of your total score for the FAR CPA Exam section. Question stem: the question stem comprises the question being asked (usually found at the end of the stem), details necessary for answering the question, and extra information. Correct answer choice: the 1 answer choice of the 4 provided that best answers the question. The distractors: the 3 other answer choices designed to distract you from the correct answer. Task-based simulations are abbreviated case studies requiring you to apply your knowledge and skills to real work-related situations. To complete a TBSs, you must use information found either in the question or in the exhibits provided to finish a task like performing a calculation, filling in a series of blanks, or revising a document. One specific type of TBS is the Document Review Simulation (DRS), which expects you to assess a document by referring to various resources. Another is the Research task, which demands that you research authoritative literature and cite the appropriate guidance. You’ll see the Research task in 3 of the 4 CPA Exam sections, and FAR is one of them. The other 2 are AUD and REG. The CPA Exam is computerized, and each section presents candidates 5 testlets containing different types of questions. FAR has 2 testlets of 66 total MCQs and 3 testlets of 8 total TBSs. Within each CPA Exam section, the total number of questions includes both operational and pretest questions. Operational questions count towards your score, while pretest questions don’t. Rather, the AICPA places pretest questions within the exam in order to collect candidate performance data. The AICPA uses that data to determine if those pretest questions should appear on future iterations of the exam as operational questions. Operational questions and pretest questions are indistinguishable. Therefore, you must simply answer all CPA Exam questions as well as you can. However, knowing that pretest questions are on the exam can give you hope. In the event that you come across a particularly challenging or unfamiliar question, just give it your all, move on, and don’t worry: it may have been a pretest question that won’t affect your score. The CPA Exam aims to fulfill a very specific purpose: confirm that you have the knowledge and skills you need to perform the CPA duties and represent the CPA certification well. To ensure that the CPA Exam meets its objective, the AICPA uses 4 different skill levels to define the difficulty of each CPA Exam section. The FAR CPA Exam section tests candidates at 3 of these 4 skill levels. According to FAR’s skill level allocation, this exam section tests at the Application level the most. Therefore, you don’t need to have the deepest understanding of most of FAR’s content to pass. However, only BEC tests at the Application level as much, and only REG tests at the Analysis level as heavily as FAR. Consequently, FAR is the CPA Exam section that relies on the Remembering and Understanding skill level the least. And as we discussed, FAR features a lot of content and many potentially troublesome topics. This combination of deeper levels of knowledge required for such a wide range of subjects necessitates putting dozens if not hundreds of study hours into the pursuit of passing FAR. Every CPA Exam sections begin with 2 MCQ testlets that the exam presents using a multistage adaptive delivery model. I know that’s a big term, but it just means that your performance in the first MCQ testlet dictates the difficulty level of the second MCQ testlet. 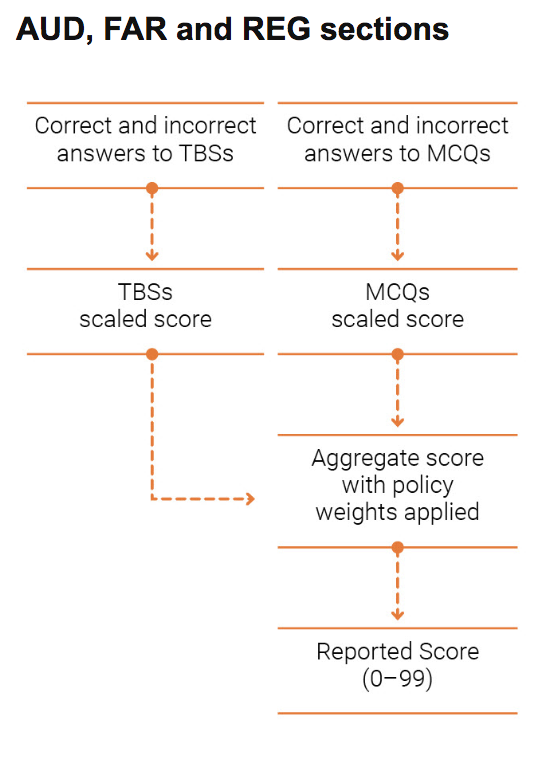 As illustrated here, no matter which CPA Exam section you’re sitting for, the first MCQ testlet you receive will always be moderately difficult (“medium”). If you perform well on this testlet, the second MCQ testlet will be slightly more difficult (“difficult”). However, if you don’t perform very well, the second MCQ testlet will moderately difficulty (“medium”) again. The average difficulty of the MCQs within determine the difficulty level of the testlet. Furthermore, the difficulty level of these questions is not binary but rather exists on a numeric scale. Because the exam awards points based on difficulty level, you get more credit for answering a difficult question correctly than an easier question. For this reason, the exam doesn’t penalize you for receiving a more difficult MCQ testlet or give you any advantage for getting 2 medium MCQ testlets. Unlike with the MCQ testlets, the CPA Exam determines the difficulty levels of the TBS testlets in advance. So, the difficulty levels of the TBS testlets don’t change according to your performance. But for non-Research TBSs, you can receive partial credit for your work. Total testing time for every CPA Exam section, including FAR, is 4 hours (240 minutes). On top of that, you will have 15 minutes to complete additional testing screens at the beginning and end of the exam. You can also take a 15-minute break that pauses the exam timer after the third testlet (first TBS testlet). As you can see in this illustration, optional breaks are allowed after the other testlets. However, the exam timer does not pause during these breaks. If you want to maximize your score and give yourself the best chance to pass, you must give yourself enough time to answer every question in the FAR CPA Exam section. For this reason, you must develop, practice, and apply a CPA FAR exam time management system. Answering each FAR MCQ in a little more than a minute allows you to finish the 2 MCQ testlets in just over an hour. You’ll then have almost 180 minutes left for the 3 TBS testlets. Your strategy for answering all the TBSs in time could be to allot a specific amount of time per TBS type. Or, you can simply give yourself 22 ½ minutes per TBS. If you give yourself 1 ¼ minutes of answering time per MCQ, you’ll have 41 minutes to complete each FAR MCQ testlet. So, after 82 minutes, there will be 158 remaining minutes for the 3 FAR TBS testlets. If you parcel these 158 minutes out evenly between the number of TBSs (8), you will have 36 minutes for the first TBS testlet of 2 TBSs and 54 minutes for each of the other 2 TBS testlets containing 3 TBSs each. Following this system, you’ll have about 14 minutes of extra time that you can spend reviewing your answers throughout the exam. Based on these 2 time management system options, you can allot anywhere from 1 to 1 ¼ minutes to each FAR MCQ. But as you may remember, the second MCQ testlet could be more difficult than the first depending on your performance. For this reason, so you might want to give yourself 34-39 minutes for the first MCQ testlet and 40-45 minutes for the second. You would then have anywhere from 156-166 minutes left for the TBS testlets. You can adapt any of these time management systems according to your comfort levels. However, you must follow your time management system as you answer practice questions during your FAR review. This way, you can perfect your system in advance and apply it instinctually on exam day. When you’re in the habit of adhering to the ideal time management system, you’ll be able to answer every FAR question. All sections of the CPA Exam are only available to take during 4 annual testing windows. Additionally, you must pass all 4 CPA Exam sections in a rolling period of 18 months, which begins once you pass your first section. So, that means you have 1 ½ years to pass the remaining 3 sections. If you don’t pass the remaining sections during this time period, the credit for the first section you passed will expire. You must then pass the expired section again and the other sections you haven’t yet passed in 18 months from the time you passed your second section. If you don’t pull this off, you’ll also lose credit for your second passed section. The beginning of your 18-month window continuously moves back to the date of your earliest passed section until you pass all 4 sections within this time limit. When addressing how you arrange the CPA Exam sections, I strongly suggest starting your CPA Exam schedule with FAR. I have 3 reasons for making this recommendation. FAR requires the most study time. As I mentioned, FAR encompasses a wide range of content. For that reason, this section usually demands more study time than any other. FAR’s content is not always very hard to learn, but the sheer volume of it can be overwhelming. If you take FAR first, you can put all of that study time behind you right away. You have to pass all 4 sections in 18 months. As I just explained, you have 18 months from the time you pass your first CPA Exam section to pass the other 3 sections. If you don’t take FAR first, you’ll have to dedicate a significant portion of your 18 months to preparing for FAR, and you may run out of time. On the other hand, if you take on FAR first, you can study for it as long as you want prior to your 18-month window opening. You can even afford to fail FAR a few times before the clock on your section credit starts to tick. Passing FAR first puts you in a very convenient position and gives you one less thing to worry about. You can actually pass FAR the first time. Personally, I don’t think FAR is the hardest section to pass. The pass rates are low, but that might have more to do with how much content FAR covers than how difficult that content is. Many candidates just don’t give themselves enough time to study for FAR. So, if you do give yourself enough time to study and you don’t find FAR’s topics to be so trying, you can pass it the first time. Therefore, if you take FAR first and pass it on your first attempt, then you not only kept all of that study time outside your 18-month window, but you also commenced the CPA Exam process with a confidence-boosting pass. Clearly, it’s a win-win. Using what I’ve learned from my personal experience, feedback from candidates, and the recommendations of CPA review providers, I estimate that total study time for the FAR CPA Exam section usually falls somewhere between 120-160 hours. Generally, the more familiar you are with the FAR content, the less time you need to study and the faster you can pass. So, how long will you need to study for FAR? Well, you can figure out what side of the study time spectrum you’re probably on via a deeper investigation into FAR’s content. You’ll find the content areas, groups, and topics of FAR in the FAR CPA Exam Blueprints. Want to pass FAR fast? Then you’ll need to study for 20 hours a week so you can finish your review in 6-8 weeks. Can’t fit that much study time into your regular routine? Then try studying for 15 hours a week. Doing so will prepare you in 8-11 weeks. And finally, if you can only study for 10 hours a week, you’ll be ready for FAR in 12-16 weeks. So, you can use any one of these study schedules or do anything in between. That’s because how fast you finish your FAR review depends on how much time you have to study in a week. But what’s important is that you study consistently so you can stay in study mode and stick to your exam schedule. Even though FAR has a history of being the hardest section, you can prepare for it effectively and pass it efficiently if you put in the time and effort. Use these study tips to brace yourself for this beast of a CPA Exam section so you can overcome it and move on. I’ve said it before and I’ll say it again: Many candidates fail FAR because they don’t study long enough. And really, this situation is understandable considering how much material you must know to pass FAR. However, you don’t have to find yourself in this predicament. Instead, you can plan ahead and stick to a rigid study schedule so you don’t run out of time to get ready for FAR. For example, if you plan to study for 3 months, try to read the book and watch all the videos in the first 2 months. Then, use the last month for your final review. During this time, you should focus on any remaining weak areas you have and try to get high quiz scores in all content areas. With this plan, you should be able to finish your course and be completely prepared for FAR in 3 months. Many candidates find bonds, pension, and stockholder equity to be the most challenging sections of FAR. For me, governmental accounting was also killer. Towards the end of my study, I took the time to understand governmental accounting. But then, I almost ran out of time for the other tricky topics. I wanted to give up, but thankfully, I decided to set aside an afternoon for tackling bonds and pensions. This choice definitely paid off: I saw a lot of questions about bonds and pensions on my CPA FAR exam. The lesson is that everyone has their particular blind spots. For this reason, you must leave yourself some buffer study time to ensure that you can achieve deep comprehension in all your weak areas. Another lesson I learned from this experience is that you never know what content will be on your version of the exam. Therefore, unless you don’t mind retaking the CPA FAR exam, you can’t risk skipping any part of your study materials. The ability to perform journal entries is the foundation of financial accounting. So, if you are not an accounting major or if you haven’t touched journal entries for a long time, you’ll have to put extra effort into this area to prepare for FAR. However, 2 resources that can really help you master journal entries are this page on principles of accounting illustrative entries and this page on fund-based vs government-wide entries. Rest assured that if you have ample time to study for the CPA FAR exam, you can pass. The questions and answers tend to be computational and clear-cut: you either get it or you don’t (unlike the subjective questions in AUD). Additionally, if you are familiar with GAAP and the related calculations, FAR is a section you can pass with relative confidence. However, if you’re worried that you’ll lag behind and not get through all of your review in time for your exam date, you might as well postpone the step of scheduling of the CPA FAR exam. In doing so, you run the risk of your preferred Prometric testing center filling up on your ideal exam dates. But, you don’t need to force yourself to take FAR when you’re not ready for it. The fact that you can schedule your exam date whenever you want is one of the best things about the CPA Exam being computerized. So, take advantage of it! With so much material to cover, studying for the CPA FAR exam might not be so easy for you. But you can still pass it, especially when you use the right CPA review course. Thankfully, I can help you find the best CPA Exam prep for you. And, I can also provide you with major savings on CPA study materials. Additionally, I can tell you how to study effectively for the CPA Exam sections and provide my best CPA Exam study and testing tips. Finally, I can tell you how hard the CPA Exam is, the secret to doubling your chance of passing, the best schedule for the exam sections, how to study for each exam section, and more in my free e-course. So, sign up today to start the process of becoming a CPA! I am writing a report for my Business Communications class about trends in accounting. I was wondering if I could use the charts on your website as visuals in my report. Katherine, sure you can. The source is http://www.AICPA.org. Hey, thanks a lot for your site. I am using Yaeger, and have gone through all the lectures for far and have been taking practice tests with the wiley software. I wanted to know about what kind of scores I should be getting on the practice tests MC section before I should be confident in taking the exam. I am getting about 70 % right now consistently. I know that the exam requires a 75 but that the scores are weighted so I am not sure where I should be before I feel comfortable with my practice scores. I’ve found this blog really helpful throughout my preparation for FAR and now I’m hoping for some advice on my situation. I’m appearing for FAR (first attempt) om May 10, 2016. I’m using Becker and score average of 85% across material and 82-85% in Final review test. Am I prepared for the exam? Do I need to look into some other material like Wiley or so as well? Can you share me which section I take before Q2 2017 changes. The next one would be REG because it is now a 3-hour exam and will become 4-hour in April. I have beckers hardcopy (without video lectures). I am doing self-study without taking any video lectures as its very expensive. Can you help with which is best prep for MCQ pratice. I recently took the AUD examination and did not pass. I was wondering in your opinion should I restudy to take the 2017 new AUD exam or start with FAR as you suggested in your post and wait to retake the AUD once I pass FAR? Thank you in advance for your help and advice. Have a great day! In Self-study, Can I only focus on video lecture? And materials that create by me referring to another book.